Gather round, children, and you will hear the strange true tale of Mayor McCrack. Yes, this most mild-mannered of cities – clean, polite, and cosmopolitan – has apparently elected an ill-tempered Chris Farley impersonator to lead it into the broad uplands of international respectability. Bad move. When he was first elected in 2010, Ford’s blunt-talking suburban conservative pushback against latte liberal impotence seemed refreshing, but by now it is clear that the plus-sized politico is wrestling with outsized demons in public. Ford’s exploits would make a crazed frat-boy blush and a mob boss rush to confession. 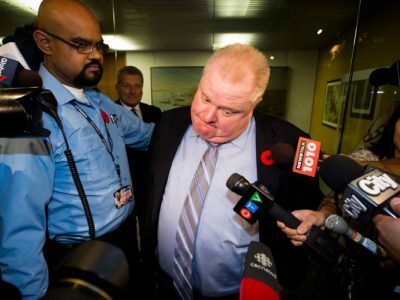 In addition to police being in possession of a long-rumored video of the mayor smoking crack with local drug dealers – one of whom had since mysteriously fallen to his death from an apartment building – a bevy of videos soon emerged with Ford in a variety of compromising positions. Mayor McCrack has a problem and so does the city he nominally leads – because there is no clear way to ditch this rolling disaster. So far, Ford has declined to resign despite the understandable public pressure to do so. Time for a reality check: this isn’t a personal issue any more. His problems stopped being purely personal the day Ford took the oath of office. For a mayor, what’s personal is public, especially when it involves serial disregard for the law and threatening to kill people. In the long, sordid history of incompetent scumbags leading major cities – from one-time Washington DC Mayor Marion Barry’s own bust while doing crack to the recent 28-year prison sentence of Detroit’s Kwame Kilpatrick for serial corruption, racketeering and extortion that helped propel his city toward bankruptcy – it is hard to find a clear parallel to the Gonzo exploits of Toronto’s Mayor McCrack. This is a man whose commitment to hard-living far exceeded his sense of civic responsibility and the consequent shame-spiral has implications beyond his bloated bad health. There is a troubling tip-of-the-iceberg aura around Ford’s exploits, incidents that reek not just of self-abuse, but abuse of power. Thanks to the indelible digital evidence of the Internet era, Ford’s past denials can be exposed as the attempted fraud they are. But as more evidence piles up, as it inevitably will, we might see something sinister beneath the hard partying in Toronto’s City Hall. After all, incompetence in an executive is usually exploited to mask more serious corruption.